Jay Sarkar is often called on to share his life story with groups of newcomers to Canada. It embodies every immigrant’s dream for a better life in Canada, and every entrepreneur’s journey to success. Sarkar came to Canada when he was 24 years old armed with a degree in electrical engineering from Ranchi University in his native India and the desire to chart his own path. After an initial struggle as a newcomer, he landed an entry-level job as a junior engineer with an instrumentation manufacturer in Concord, called Scintrex. That was in 1977. Sarkar worked his way up the ranks, becoming senior vice-president and a member of the publicly listed company’s board. “I worked hard, built a strong team and made sure we were all focused on quality and providing exceptional service to our customers,” says Sarkar. The result: unprecedented growth of the nuclear and military division he managed, which, under Sarkar’s leadership, became the most profitable division of Scintrex. 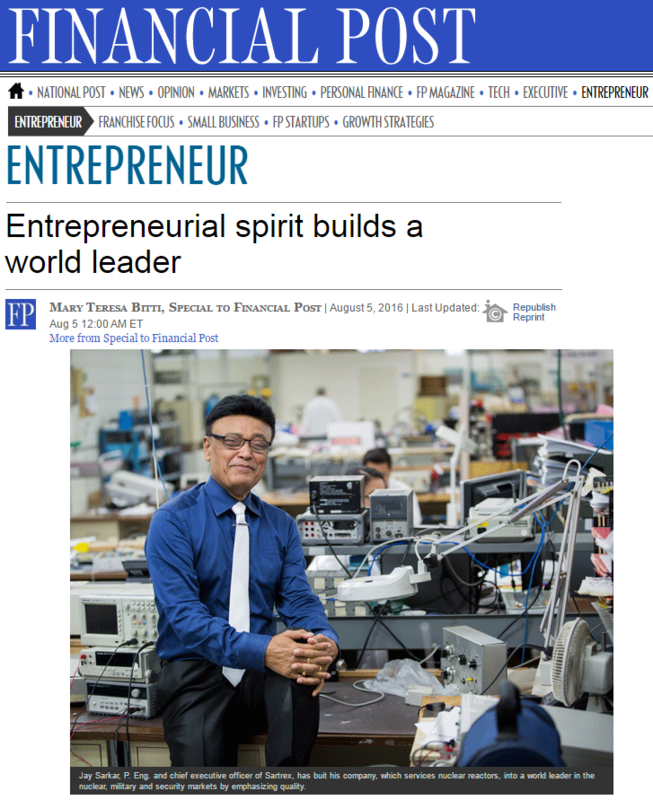 While he was happy in his role, Sarkar, whose father had built his own business in India, realized he had a new dream: to become an entrepreneur. When a hostile takeover of Scintrex led to the divisions being sold off, Sarkar approached the chairman, assembled an acquisition team and, after about 18 months of negotiations and initially being turned down, he purchased the division he had built in 2001 and named the company Sartrex, combining his own name and that of his previous employer. Sixteen years later, Sartrex is housed in a 40,000-square-foot facility with a sizable and growing workforce, including his son, daughter and son-in-law and the original 25 or so employees who worked for him at Scintrex. No one has ever left. In the high-tech environment where the skills his employees possess are in high demand, it is a remarkable testament to the company’s culture. The company now has distribution channels in countries all over the world, including Korea, China, Argentina, Romania, India, Pakistan and most parts of Europe. Revenues have grown four-fold in that time. It’s a responsibility Sarkar and his team take seriously and one that extends beyond the nuclear industry. Sartrex has also developed a fully automated machine that analyzes dosimeter cartridges for Health Canada and continues to be used as part of its safety standards to minimize the amount of radiation employees are exposed to as they perform their roles. Together with the Ontario Institute of Technology, Sartrex is also in the early-stage development of a research project aimed at building a new technology that will provide added reliability to Generation III reactors. Sartrex continues to work closely with Hamilton’s McMaster University in the development of next-generation detection devices with applications in medicine, law enforcement and dealing with dangerous goods. Sarkar believes knowledge and wealth must be shared; if you are in a position to help, you must. This guiding principle is behind his many philanthropic contributions to help better society. He served as president of the Prabasi Bengali Cultural Association (PBCA), a non-profit cultural association. He is actively working with the government of West Bengal, India to set up a medical college in Kolkata, India. This effort is reflective of his years-long dedication to stimulate and improve the cultural side of the Bengali community. In addtion, Sarkar was the chairman for North American Bengali Conference (NABC) in 2008 and again in 2013 and is a lifetime member of the Canadian Adult and Community Education Alliance. Sarkar is also a very active member of the Organization of Canadian Nuclear Industries. When asked about the success of the company, Sarkar immediately cites quality (“our products have to last 30 years”), on-time delivery, competitive pricing and the strength of the relationships he has built over the years. But underpinning all of that is a corporate culture defined by inclusivity, respect and the willingness of every team member to help each other. And, he notes, his rise has not been a solo voyage: Sarkar credits his wife, Chitra, as the “anchor of the family” and says that part of the success can be attributed to her support. As for the future, Sarkar is enjoying witnessing the next generation grow into their roles and help evolve Sartrex and take it to its next phase of growth.